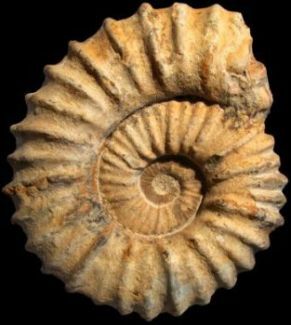 "When collectors go scouting in the fossil rich layers of the Swiss Jura mountains, they are usually looking for the beautiful spirally coiled ammonites. These fossils are the remains of creatures related to octopus and squid that first appeared around 400 million years ago, spread throughout the world’s oceans, then died out at the same time as the dinosaurs approximately 65 million years ago. 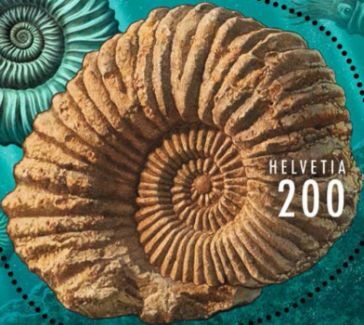 Ammonites had an outer shell like a snail, but the inner part of the shell had chambers of the kind we can still see today in the living pearly nautilus. The shell protected the soft parts of their anatomy, while air in the chambers created buoyancy. The septa dividing the chambers were tightly folded at the edge, presumably making the shell better able to withstand water pressure. If the external shell is no longer present or is removed from an ammonite, these folds are marked by ridges known as suture lines. 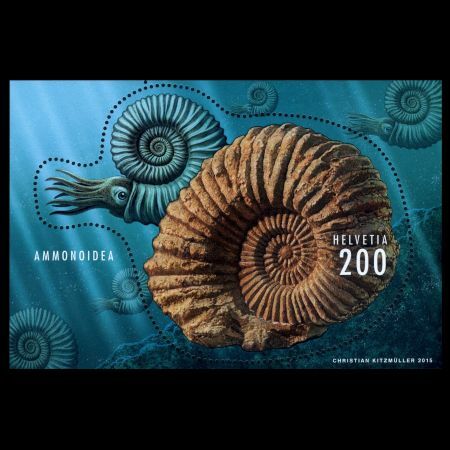 We know that ammonites are more closely related to today’s squid and octopus than the pearly nautilus. We are also familiar with the anatomy of ammonites’ jaws, know that they did not have ink sacs, that they are likely to have fed on small prey, and probably lived a largely hidden existence close to the sea floor. Many questions still remain unanswered, however. Did they have eight or ten tentacles, or perhaps up to 100 like the nautilus? Did their tentacles have suckers? Did the ammonites have powerful large eyes with lenses like living cephalopods? There were a huge variety of ammonites. 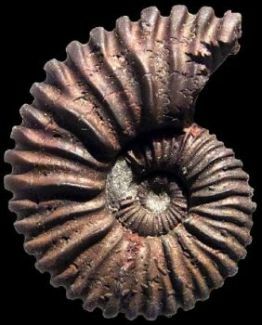 It is estimated that almost 20,000 different species of ammonite existed, although spread over a period of some 335 million years. There are ones with disc shaped and spherical shells, smooth and ribbed shells, as well as ones adorned with spines and tubercles. 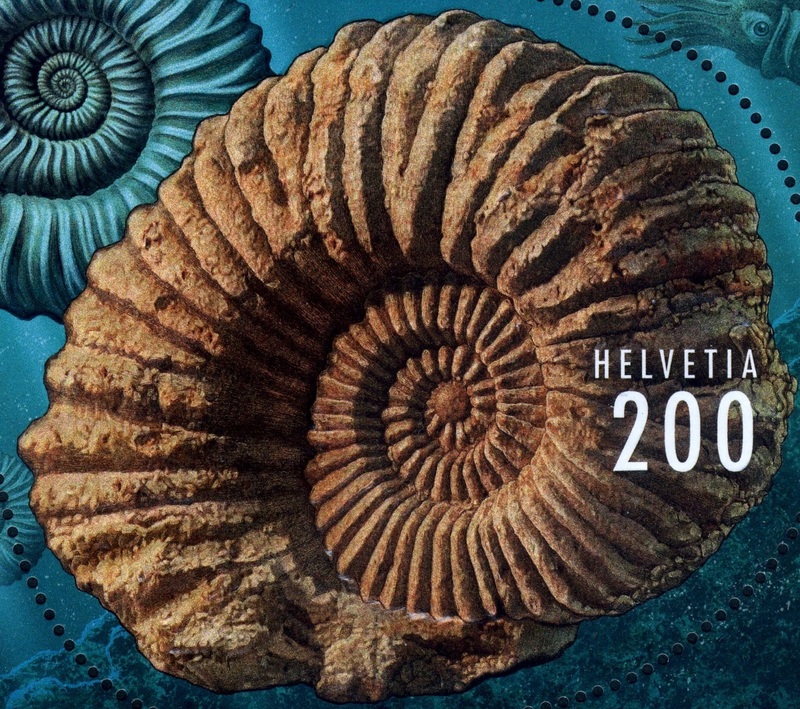 Each of these numerous types of ammonite existed for only a short period of time. 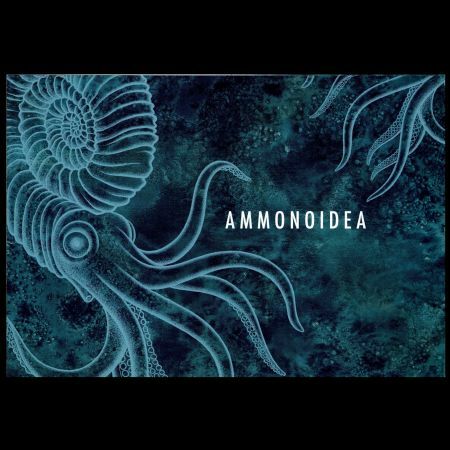 Ammonites therefore make excellent “index fossils” which can be used to date geological strata. 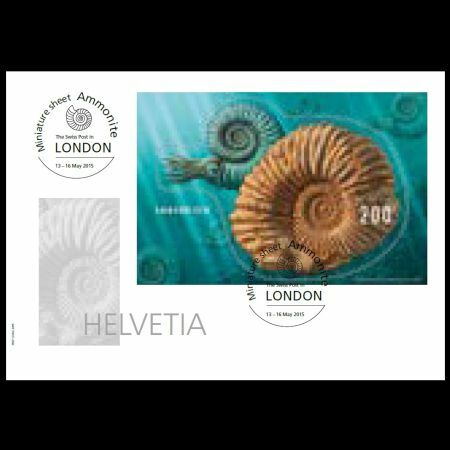 On the basis of its characteristic ribs, the ammonite depicted on the stamp is probably a Colombiceras, a species of ammonite that lived during the Cretaceous period around 120 million years ago." 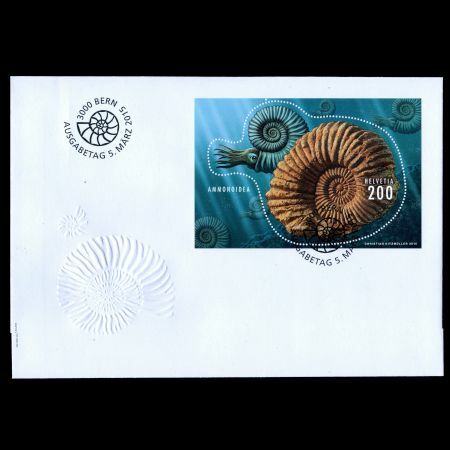 However, Dr. Hans Ulrich ERNST, author of some books about fossil on stamps, recognized the ammonite depicted on the stamp as Cheloniceras specie. The following pictures illustrate the differences. 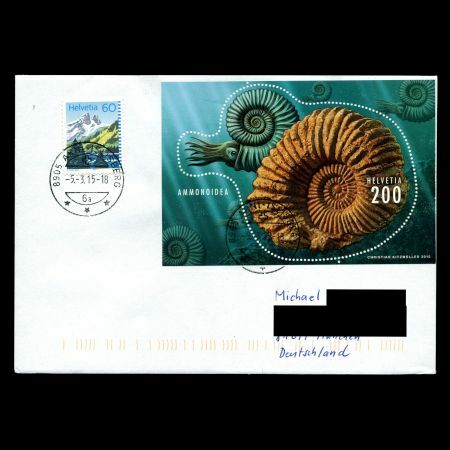 According to Mr. Dr. Ernst, the stamp designer said that he had received this fossil from a friend and he don't know it origin. 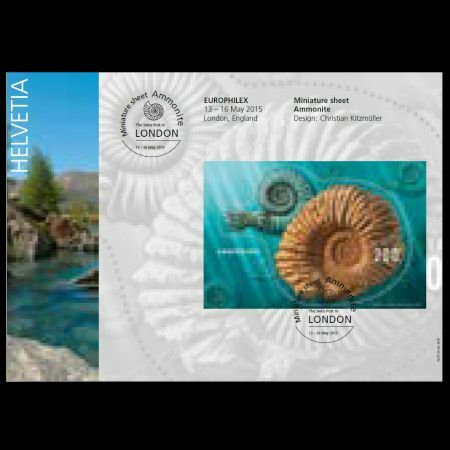 Pity that Swiss Post missed an opportunity to depict some real local fossil on their stamp and depict Moroccan art object instead. 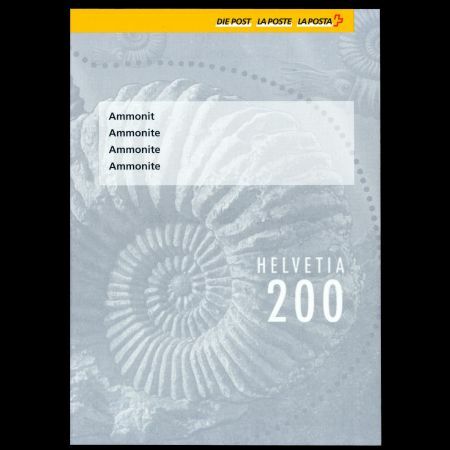 Acknowledge: Many thanks to Mr. Dr. Hans Ulrich ERNST for his hint about amonite specie.